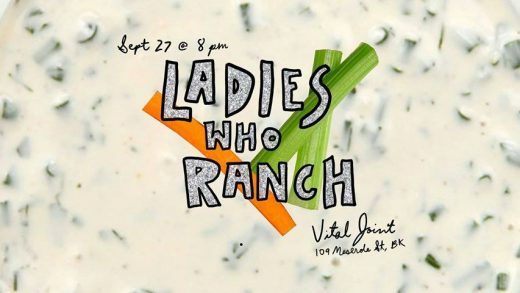 However, the Ladies Who Ranch is in fact not a salute to dressing or even cows, it is a night of comedy by a group of women. Specifically, Kelly Cooper, Rachel Kaly, Maya Sharma, Caitlin Dullea, Caroline Yost, and Sophie Zucker, all of whom were frequent performers at the now-closed Annoyance Theater. Plus, special guest Eliza Cossio of The Daily Show will also be gracing the ranch land with her presence. Tonight, you shall see stand-up, sketches, and multimedia performance, and after the sets have concluded there will be an open mic for you to try your hand at something weird and wacky. I know what you’re thinking. Those previous four puke fests were not enough. You are craving more; you feel it burning in your bones and particularly in your esophagus. Well, you’re in luck. 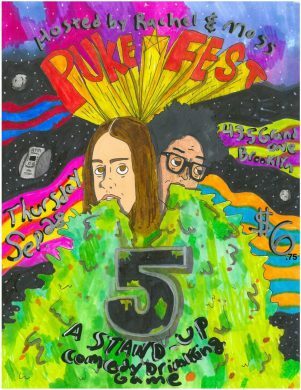 Puke Fest 5, a comedy show that is also a drinking game, dribbles/projectiles once more into Brooklyn. While I already explained the concept of the show, here it is in more detail. Comedians will perform stand-up sets. Before the sets begin, the show’s hosts Rachel Sennott and Moss Perricone will let you know that every time each comedian does or says something, you are to take a shot. Not sip a beer, take a shot. Maybe you can be the first to turn alcohol-induced vomiting into its own stand-up routine. 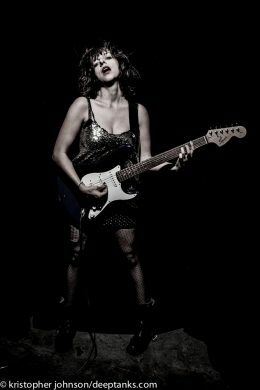 While musician and performer Sabrina Chap says she typically does work with more of a “schadenfreude” bent, her latest creation is a little more sentimental. 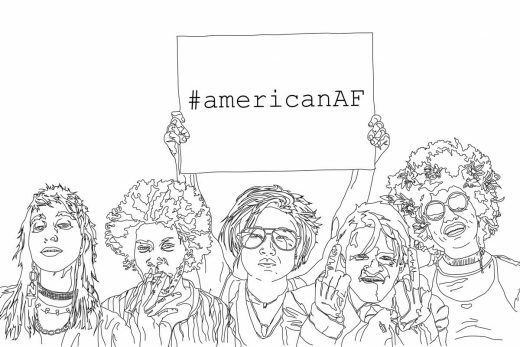 Part concert, part monologue showcase, part “radio musical,” Postcards From Nevermore centers around two queer teens who depart troubled homes in Florida (it is always Florida, isn’t it) to find somewhere better. Their story is told through a teen narrator who writes postcards to her sister, which she recites aloud in the form of monologues. It’s not just these monologues that spin this tale, but a variety of songs that will be performed live. Things, as usual, are pretty bleak IRL, so maybe seeing a fictional tale of people trying to find a better life will help. Let’s be honest here, when people think of theater, they do not usually think of radical, boundary-pushing work that is accessible to a wide variety of groups. I do theater, and I rarely think that. And don’t even get me started on theater FESTIVALS, which are usually peppered with mediocre work not saying anything particularly interesting and even worse poster designs. Sorry, just speaking on what I have observed over the years. That’s why this new pop-up theater festival feels so refreshing, as it explicitly and unabashedly aims to give a platform to black, brown, queer, trans, and politically radical creators, in an effort to stop white, straight, cis creators from being the default in theater. It’s not just plays; the festival also includes film, dance, performance art, and discussion, making it appeal to an even wider range of demographics. Rather than cherry-picking what shows to see out of a packed and overlapping calendar, at this festival you experience many works in a row throughout one evening for one price. Some will repeat other days, some will not. Nowadays, there are not a ton of places you can go in the city to see circus performance. There’s the ubiquitous House of Yes, Coney Island’s sideshow, and Long Island City’s Circus Warehouse, which is more of a training center than a venue. There’s also The Muse, a high-ceiling-ed space located off the Wilson L stop that offers both circus performances and lessons. 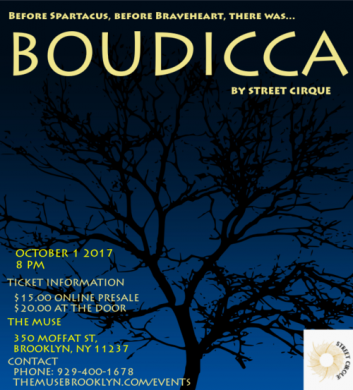 This Sunday, their resident artist Street Cirque will be presenting Boudicca, a theater-circus fusion show based on the historical tale of a woman named Boudicca who leads a rebellion against the Roman Empire. Maybe you will walk away with some tips on how to be more flexible and/or start a revolution of your own.